I came across this recipe while watching The Food Network a couple of weeks ago. It does take a bit of time to bake, so it’s perfect for the weekend! It wasn’t originally gluten free, but I substituted the normal flour with gluten free and they turned out delicious, chewy, rich, and I promise you won’t taste that ‘gluten free’ after taste! He makes these brownies in a variety of ways including Peanut Butter, Mocha and White Chocolate. (I promise I’ll make and post all of these in the future!) But for now, you’re *stuck* with my triple chocolate brownies. First, in a small bowl (or a mixer! ), whisk together the flour, cocao powder, baking powder and salt and place to the side. Next, in a double boiler (so the chocolate doesn’t burn – DO NOT melt chocolate in microwave!) melt chocolate and butter. Once thoroughly mixed, add vanilla and brown sugar and mix until blended. Once mixed, take the bowl off of the boiling water and place to the side to cool slightly. In another separate bowl, lightly whisk eggs. Finally, add the warm chocolate mix to the dry ingredients and start to mix. I used my Kitchen Aid mixer, but you can do this by hand or with a hand held mixer! Finally, add the eggs. Place the brownie mix in a lightly greased pan and bake at 350 for 20 minutes! I was going through my good friend Skyes’ blog (http://stonehouseburgundydoor.blogspot.ca – go check it out!) and came across her DIY Valentines Day Chocolate Bark. I’ve never been a huge Valentines Day person, but thought I should be romantic for once and make my boyfriend something (added bonus – I can eat all of it). I’m not going to lie, it was a really messy afternoon in the t.listed kitchen. There was chocolate everywhere! But everything turned out delicious, so it was well worth it. I used our ice trays from Ikea – heart and stick shaped. They bend, which makes it easier to get the chocolate out. I don’t know how this would work with non-bendable ice trays.. So if you don’t have one I suggest getting one before making these! First, put your Cadbury Mini Eggs in a Ziploc bag and, with a rolling pin, crush them into small pieces. Next, place your chocolate in your double boiler on medium heat and stir until melted and smooth. Once thoroughly melted and with the help of a spoon, put the melted chocolate into the heart shaped and stick ice trays. When all of them are full, take a knife to smooth out the top. I melted the Hershey’s Cookies & Cream chocolate and made chocolate sticks with half white chocolate and half cookies & cream (it was the best one!). I wish I made the hearts this way.. So I suggest you mix both chocolates together! So it’s Superbowl Sunday and you’ve just been invited to your friends house to watch it and have to bring food.. But you have no idea what to make. No need to worry! I have a super easy recipe that will surely make you the most popular person at the party. Instead of going with the usual Pigs in a Blanket or Nachos, I opted for more sophisticated, delicious and (best of all) gluten free dish! First, in a small bowl (or a mixer! ), whisk together the flour, cocoa powder, baking powder and salt and place to the side. In another double boiler, melt the peanut butter and butter together. Once melted, add your Chipits and stir! Once melted, place to the side. Finally, add the warm chocolate mix to the dry ingredients and start to mix. I used my Kitchen Aid mixer, but you can do this by hand or with a hand held mixer! Finally, add the eggs. I added some of the peanut butter mix to this as well, but make sure to save some for the end! Place the brownie mix in a lightly greased pan. Pour on the rest of the peanut butter mix and swirl away! Bake at 350 for 20-25 minutes. In all honesty, I never knew chocolate pie was a ‘thing’. I was lying in bed watching The Office (as per usual) when Jim mentioned pies to Pam. He talked about the usuals: apple, blueberry, peach etc.. and then, CHOCOLATE. WHAT?! I immediately turned to my boyfriend to make sure I heard that properly. He assured me that, yes, chocolate pie has been around for a while and I have subsequently been living under a rock. In a daze of excitement and confusion, I agreed to make said pie the next day. It was surprisingly hard to make. It reminded me of lemon meringue pie (my favourite and one I make all the time) since it involved a lot of constant stirring and attention. 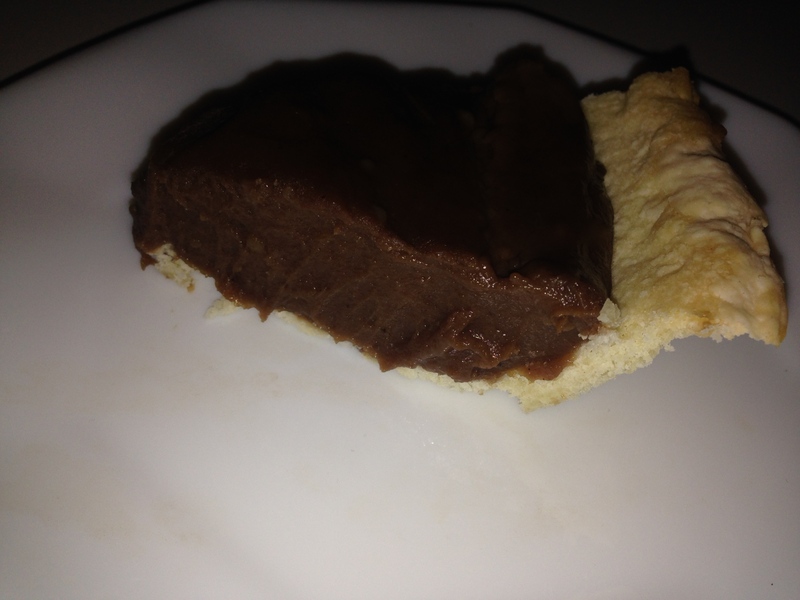 I was somewhat happy with the result, I just found the chocolate filling to be a bit too sweet. If I were to make this again, I would definitely reduce the amount of sugar (and advise you to do the same!). Having never made it before, I randomly chose a recipe on Google. This is the one I picked (yes, because of the ‘fudge’ aspect of it). With a few changes and alterations, this could be a really good recipe! In a medium saucepan, combine sugar, flour, cornstarch and salt. In a separate bowl, combine milk and eggs yolks (whisk thoroughly!). Once this is all mixed properly, put heat on medium and slowly pour in the liquid mixture to the dry ingredients. It is crucial at this point to continuously stir, otherwise you may get cooked egg yolks floating around and it may burn at the bottom! It took a while for the mixture to become thick, but just be patient! Mix until it comes to a full boil. Once it’s boiling, mix for about another minute then take it off the heat. Add the chocolate, butter and vanilla and mix thoroughly until smooth. 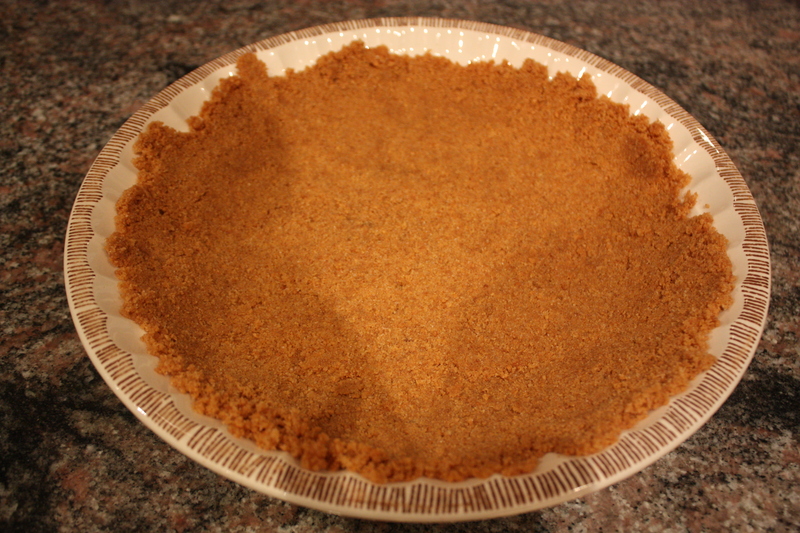 Pour the deliciousness into your pie crust, and let it chill for about 4 hours before serving! Once ready to serve, beat your egg whites (add a pinch of sugar) and eat away! You can also replace the meringue with whipped cream, but that would have been sugar overload for me! Winter is a season full of delicious, comfort foods that we can eat while we’re curled up on the couch. Ones of my favourites when the snow starts to fall is always pie! Lately I’ve been craving a Banana Cream Pie, even though this isn’t your typical choice when it comes to “winter foods”, but I decided to try it out a new recipe anyway! This is a pretty easy, low maintenance recipe (for both the crust and pie filling) and would be perfect for summer parties or any occasion you’re looking for a chilled dessert. 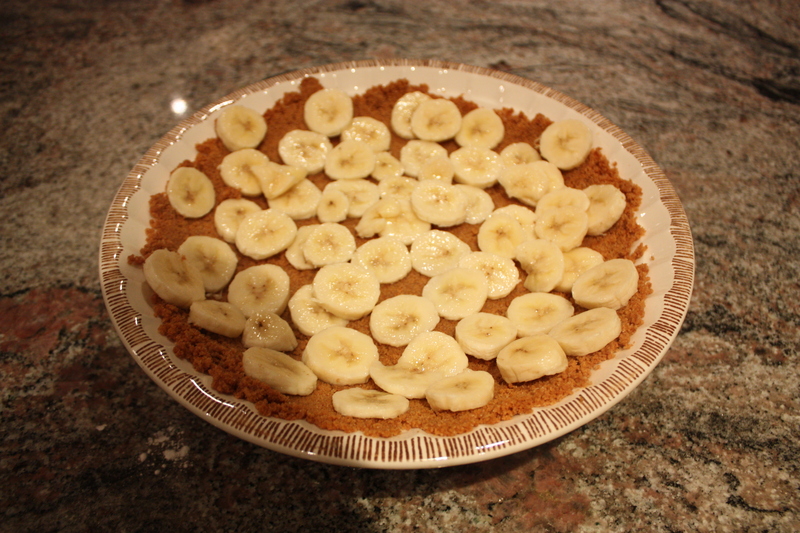 You can also make this recipe NO-BAKE if you purchase a no-bake graham cracker crust. If you are choosing to bake the crust, I would recommend doing it before the pie filling and whipped cream. 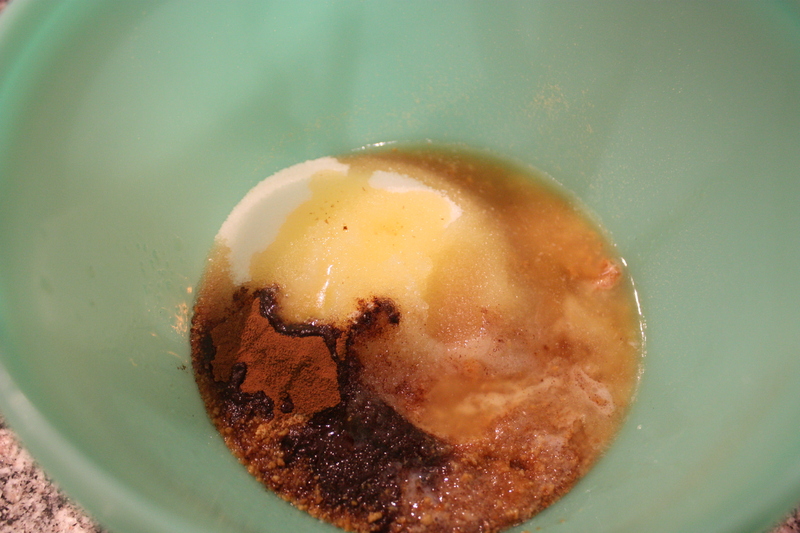 In a medium bowl, mix the graham cracker crumbs, sugar, melted butter, and cinnamon until very well blended. Press the mixture into a pie plate ( 8 or 9 inches). Bake at 375 degrees for 7 minutes. Then chill the crust in the fridge until the pie filling is ready. In a large saucepan or pot, mix the sugar, cornstarch, salt, and milk until smooth. Cook on medium heat until thick and bubbly. Stir and cook 2 minutes longer. Remove from heat. Add a small amount of mixture to eggs, stir, and then return all of mixture to the pot. Bring to a boil, stir, cook 2 minutes longer. Remove from heat. Stir in butter and vanilla. Put the mixture in a bowl, cover with plastic wrap, and put in the fridge to cool for 30 minutes. 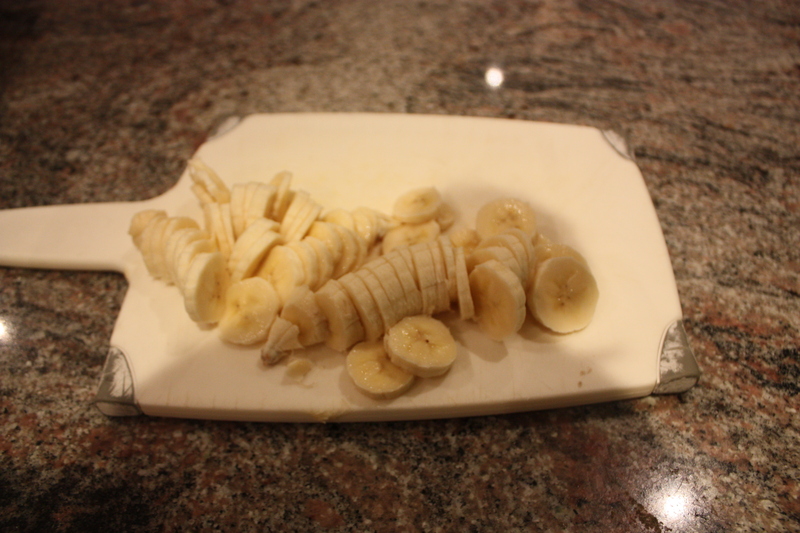 While the pie filling is cooling in the fridge, slice the 2 large bananas. 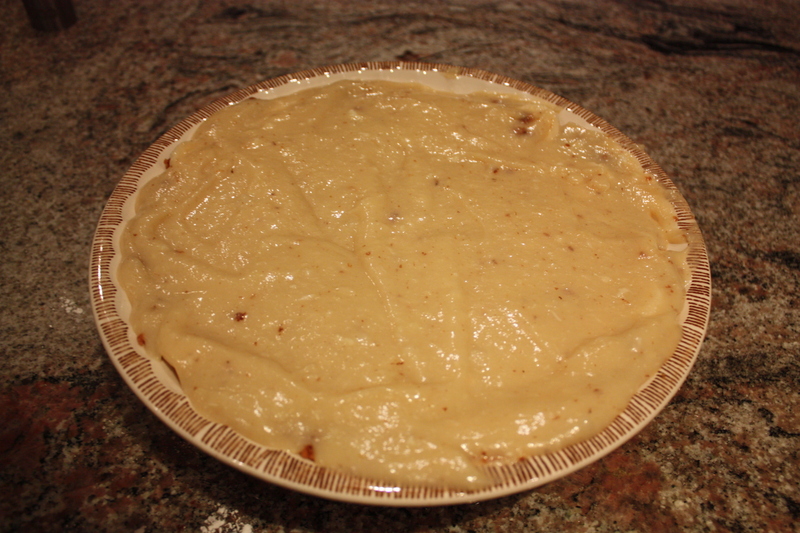 Layer the banana slices on top of the pie crust. If you have extra you can save them for the top of the pie. 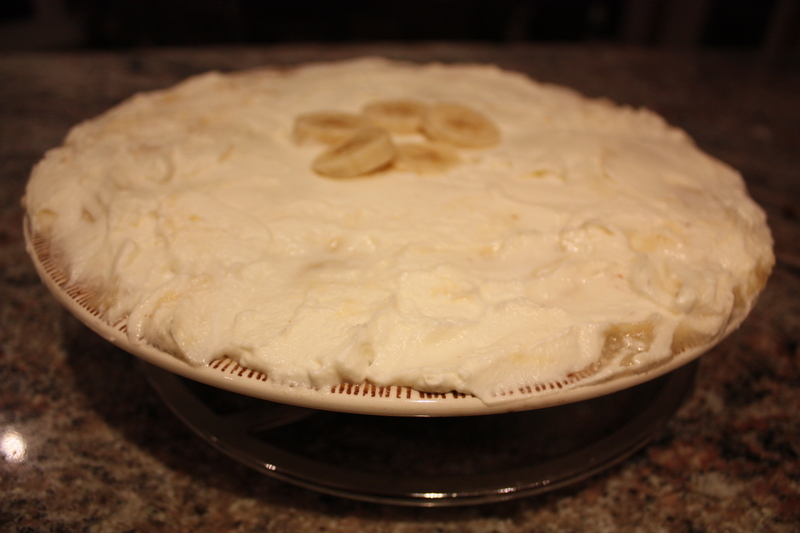 Once the filling has cooled pour it over the pie crust and bananas. Top with whipped cream and add any extra bananas for garnish. Put pie in the fridge and let it sit for 1-2 hours before serving. 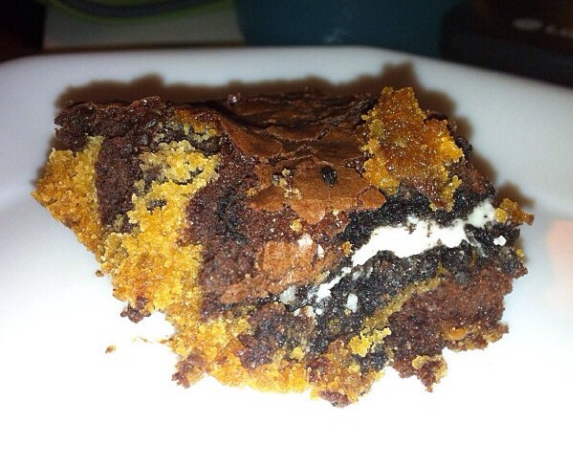 I’m sure you’ve all seen the pictures pretty much everywhere of the famous ‘Slutty Brownies’. Yeah they look delicious, but do they really taste that good? Yes. Yes yes yes. YES. If you haven’t made them, MAKE THEM NOW! They’re cheap to bake (all of the ingredients put together cost under $10), easy and will make the day of anyone you give them to! I got lazy and decided to make these with premade brownie mix and cookie dough. But you can make this with your own recipes! First, spread the cookie on the bottom of your greased pan. 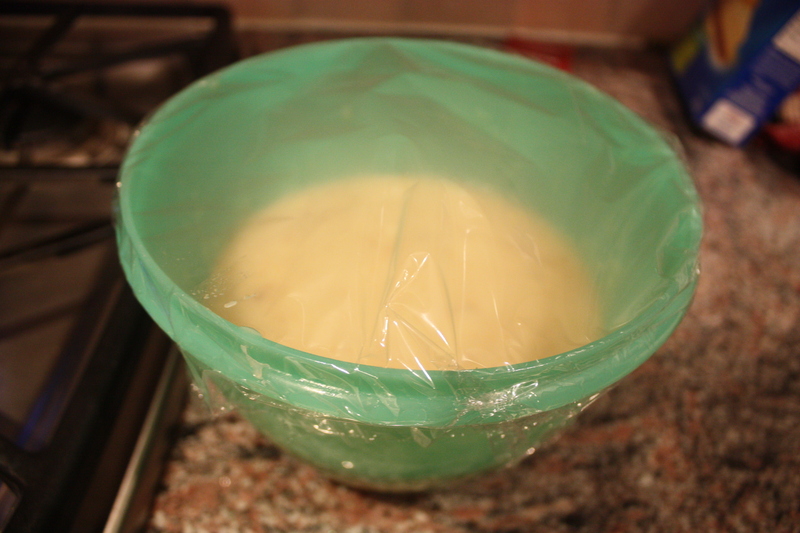 This is much easier when the dough is at room temperature. Once the cookie dough covers the entire bottom of your pan, take your Oreos and place them in straight lines and columns over the cookie dough. 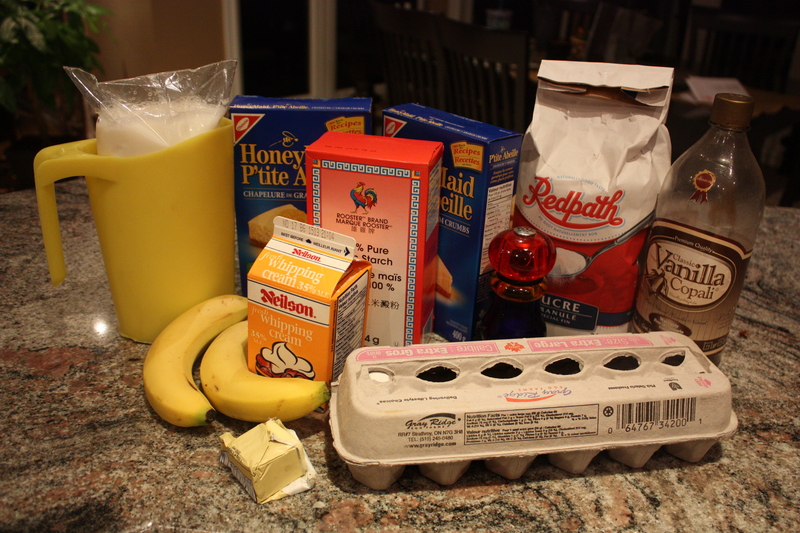 Next, make your brownie mix. I never follow the directions on the box; I only put 1 egg in and the asked amount of oil. It always tastes the same! Once the brownie mix is made, pour evenly over the Oreos. Now it’s ready to bake! Put it in the oven at 350 for 25-30 minutes. I took it out at about 26 minutes, because I love my brownies chewy. Finally, cut them up and get ready to become everyone’s new favourite friend!